"Le Quesnoy (pronounced Leck con wah) is a town in northern France. It is surrounded by high walls and deep trenches. In World War 1 it was occupied by the German army for four long years. In November 1918 the town was liberated by soldiers from far-away New Zealand. Because thes... read full description below. Le Quesnoy (pronounced Ler kay nwah) is a town in northern France. It is surrounded by high walls and deep trenches. In World War I it was occupied by the German army for four long years. In November 1918 the town was liberated by soldiers from far-away New Zealand. Because these men used a bit of kiwi ingenuity they were able to take the town back without a single civilian life being lost. 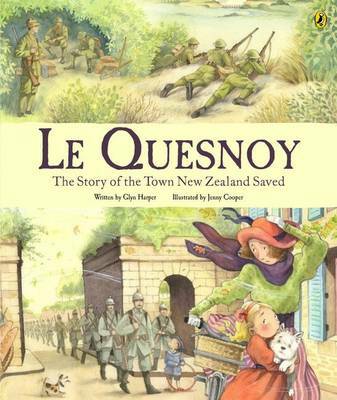 This has become one of the most famous stories in New Zealand military history and the relationship between Le Quesnoy and New Zealand continues to this day. This book tells the story of Le Quesnoy's liberation through the eyes of a child living in the town at the time. Stunning watercolour illustrations and simple language make this an ANZAC picture book that young readers will be able to imaginatively engage with. Glyn Harper is Professor of War Studies at Massey University in Palmerston North, New Zealand. He is now General Editor of the Centenary History of New Zealand and the First World War. A former teacher, he joined the Australian Army in 1988 and after eight years transferred to the New Zealand Army, where he rose to the rank of lieutenant colonel. Glyn was the army's official historian for the deployment to East Timor and is the author of eighteen books which include Kippenberger: An Inspired New Zealand Commander; In the Face of the Enemy: The complete history of the Victoria Cross and New Zealand; Dark Journey: Three Key Battles of the Western Front; Images of War: World War One: A Photographic Record of New Zealanders at War 1914-1918 and his most recent Letters from Gallipoli: New Zealand Soldiers Write Home. Le Quesnoy is his seventh children's book.